Dubbed a ‘dark Odyssey about the dawn of artificial consciousness and the future of sin, Westworld is HBO’s most anticipated TV series since Game of Thrones. It follows events happening in a futuristic theme park populated by artificial beings. The park is open to visitors for 40,000$ a day, and is designed to indulge every human appetite, no matter how noble or depraved. Anthony Hopkins leads the impressive cast of the 10-episode series, which also features Ed Harris, Evan Rachel Wood, James Marsden, Jeffrey Wright and Thandie Newton. 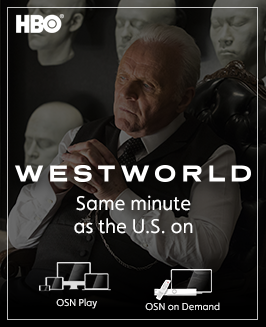 Watch season 2 of Westworld exclusively on OSN First HD – Home of HBO and check out six facts every Westworld fan should know. Westworld is based on the 1973 movie of the same name, which featured Yul Brynner, Richard Benjamin and James Brolin. The series is written and directed by Jurassic Park creator Michael Crichton with Star Wars Director J.J. Abrams and Jonathan Nolan as executive producers. The total budget of the series stands at $58 million. The Simpsons referenced Westworld in their episode ‘Itchy & Scratchy Land. Westworld music was composed by Game of Thrones composer Ramin Djawadi. Quentin Tarantino was initially linked to the project.